Technically it's not a fries as it's baked in the oven with just a little oil to prevent eggplants from absorbing too much oil in it. Cut eggplants lengthwise into 1/2 inch strips, mix with salt and set aside for 30 minutes. Preheat the oven to 450 F/230C. Rinse the eggplants under a running water to remove excess of salt, pat dry with the towel (or paper towel). In a large bowl combine olive oil, chopped rosemary, garlic and cayenne pepper and coat eggplants in the mixture by tossing it a few times. Transfer to a baking sheet and place on a middle rack in the oven. Bake 25-30 minutes, turning the baking sheet 180 degrees half way through the baking. Oh my! I bet these are GOOD! Yum, this is my kind of dish. I love eggplant, spices and things that are healthy for you even if they seem a little bit naughty! I don't remember when I bought chips, but if they sell something like this, I would be first in line... :) Thanks, Lorraine, for your comment! I love oven fries, honnestly we don't eat a lot of fried stuff... Love your aubergines fries, these looks really good! they're gorgeous! Eggplant is one of those foods that I never can nail...either too rubbery and overdone or not done enough. These make me want to try again! "Warning: highly addictive!" - Oh yeah, I can imagine! Every time I fry aubergine I end up eating most of it before it's time to serve it up... oops :D. I never tried them like this before - what a fantastic idea! I'll give them a try next time I'm looking for a delicious snack! Those sure look wonderful and healthy (I am not into deep frying either). What kind of eggplant did you use? I've never tried doing them in the oven but this is much healthier! I love that special flavor...my mouth is watering now! Enjoy your weekend! Hugs! Hi Diane, I love oven, it's a time saver too: just place everything on a baking sheet and oven will do it's job... :) Thanks for your kind comment. I've always loved eggplants, and this dish looks great! I always enjoy learning something new from you, have a great weekend! I love roasting eggplant! In fact I did it tonight, although I cubed mine rather than cut them into fries, and didn't use as interesting a spice assortment as you did (I was actually making them to use in another dish). I find, though, that when I roast I don't need to do the salting, resting, and rinsing step. But then I usually don't buy those huge eggplants, so maybe that's the reason. Anyway, I'll have to try this - thanks. Hi Marina, that's really interesting. The way I do it, you do get a bit of a crust on the eggplant, but not as much as I'd like. I got a real bargain on the eggplant and I have some left - I'm planning on roasting more later this week. I'll try your method and see how it works. BTW, the dish I made with roasted eggplant is Pasta alla Norma - really good stuff. 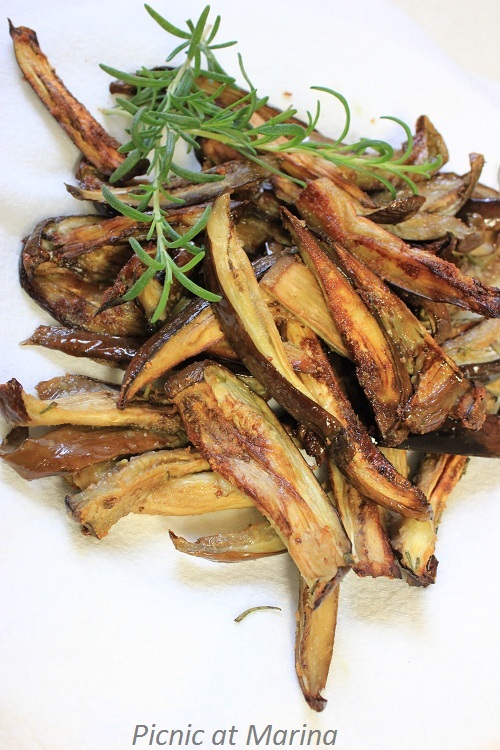 Traditionally one fries the eggplant in oil for this dish, but I like it better with roast eggplant. John, let me know when you make it how you like it. I don't like frying eggplants either: they absorb too much oil, and then all you taste is oil, oil, oil, and maybe a little eggplants... Pasta alla Norma, that sounds interesting. Will it be on your blog? I wish my family would love eggplants. They unfortunately don't. I love eggplants and always looking for an idea to use them in different ways. I have seen eggplant fries quite often these days, so I better give it a try soon. Do they get crisp after roasting? Hi Holly, If you follow those directions, they should get crisp after roasting, yes. Let me know if you make it.. :) Thanks for your comment. excellent this recipe. I needed a new way of doing eggplant. I love the fact that you have made it spicy. Great tip. You come up with the most clever dishes. I look forward to trying these myself. I've seen so many veggie fries but none of them are eggplant! How cool! I love eggplant and it's one of top 5 veggies I love eating - even everyday! I have to try this recipe for sure. Thanks for sharing with us! I bet these are addictive! I'm reading the recipe and wondering why I haven't seen or heard of these before? (Well, isn't that a useless exercise?) I will definitely be making these, especially since they're baked and not fried. Thanks, Marina, for sharing a great dish! What a great way to prepare eggplant. These looks so good, Marina. I have to try that and it's perfect for my diet! I found your blog via kitchenriffs and am so thrilled that I have. I *love* the idea of making "fries" out of any sort of vegetable, so this one's right up my alley. Thanks for sharing!